I want my Nanny: Earth Day Giveaway - Win an Anti-Bottle! 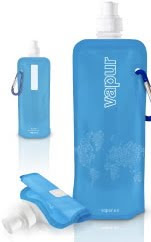 "Vapur is quite simply the most portable refillable water bottle on the planet. And by making tap water more portable, we hope to make bottled water obsolete. " I loved this earth-friendly, purse-friendly, BPA-free product as soon as I saw it. I bought three for my family and one for you. Leave me a comment about your nanny, nanny life, or my new blog design. I'll get Dear A to pick a number and that commenter will win the bottle. Pretty straight forward, but remember, 'Anonymous' won't get you anything. Happy Earth Day, and thanks, as always, for reading! My nanny is the best! Here name is Jennifer and she started working for us in September 2008. She sort of fell into our laps and is the perfect mix of soft & loving (for E) and Tough-no-nonsense (for V) She treats our kids like they are her own - I never have to worry or even have a moment of concern when she is at the helm. She has become a family member and often joins us (with her hubby) for dinner or for a movie. I can't imagine our life without her. We are moving to Florida next July and one of the hardest things to leave behind (other than my mom) will be Jen. But I know she will be a life long friend to my kids and to us. I need your help with nanny etiquette. My nanny whom I adore very much recently stopped having playdates with one of the other nanny's in the neighborhood. Apparently a few other nannies in our neighborhood have stopped as well because she is too harsh with the kids & yells a lot. After hearing some of the comments she has made, I have to agree ("your daughter talks very well, not like these mutes I take care of"...in front of the 2 year olds!"). I don't know the parents well at all, but should I say something or stay out of it? We love, love, love our Nanny. She's wonderful with our kids and takes great care of all of us. 100% trust, kindness and love. @ Michele - Definitely! I bet you could get parents to donate to make a pretty great prize pack!